The transnational corporation, Statoil (based in Norway), has entered into a singular agreement with the british crown treaty partner (Te Tiriti O Waitangi) to explore and drill for deep sea oil off the coast of Ahipara in the Te Reinga Basin of Aotearoa/New Zealand. 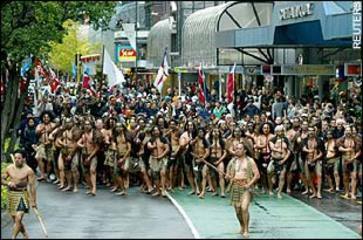 They have ignored the other equal treaty partner, the Native people of the country (Māori), who have rights and claims over the area and who are 100% opposed to any exploration, seismic survey, or drilling of any kind in the land or seabed. Statoil was given a 15-year exploration permit to search and drill for oil off the west coast of Northland, In December 2013. This permit covers just under 10,000 square kilometres of seabed. Statoil intends using sonar explosions to penetrate the seabed and bounce back to see what is below. These seismic surveys have been strongly tied to fatal whale, dolphin and giant squid strandings and deaths at sea. Then they’ll analyse the information and apply to drill for oil in the most promising places. The drilling phase would target the seabed between 1,000 and 2,000 metres below the waves. The Gulf of Mexico spill happened by drilling in 1,500 metres of water. Opponents claim that government regulations over deep sea oil drilling are completely inadequate and if things go wrong, the Government requires these companies only to pay a small amount towards cleaning up an oil spill while the cost to our livelihoods, economy and international reputation would be devastating and would amount to billions of dollars. Further while politicians have been claiming that there will be thousands of jobs for the north in deep sea oil drilling. Yet according to meetings with Statoil, there will be no jobs for the north and any servicing would happen out of Taranaki (1). They state that "in the petroleum context, Te Rarawa maintains our preexisting responsibilities and rights, affirmed by Te Tiriti, to exercise our customary authority over our lands, territories and associated resources." Impacts they highlight include those to their cultural resources and historical fishing routes, the environmental impact on sealife and the need to leave oil under the soil (and sea) to prevent global warming. (2) The issue can be traced back to 1840 when the British crown entered into a treaty (Te Tiriti O Waitangi) offering sovereignty to Māori people, they have used the english translation and assumed 'governorship', which was a made-up word. No Māori ever would give up sovereignty, least likely chiefs, unless coerced to sign (which indeed happened). 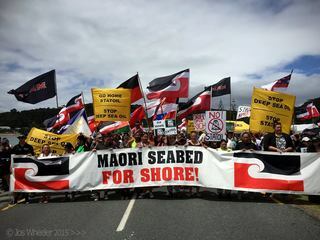 In 2004, after decades of protest against land theft and confiscation (raupatu), the government turned its sights on the foreshore and seabed. A new law was pushed through parliament called the Foreshore & Seabed Act which saw the largest land grab/theft in the history of Aotearoa. The crown assumed ownership of the entire EEZ (the largest in the country). 50,000 people marched against the bill, politicians crossed the floor and denounced their parties, started the new Māori Party, and still the bill passed. It was obvious the crown had plans to sell off and profit from the foreshore and seabed, and Māori and non-Māori are still fighting today for justice, Tino Rangatiratanga (sovereignty), and for the crown to HONOUR THE TREATY. Project Details No extraction has begun, but 2D seismic survey has been completed in the face of 100% opposition by native Māori and local people. The impact on our large marine mammal and fish populations is a difficult science to report on based on the remote and deep sea environment. divestment from fossil fuels that link directly to climate change. Why? Explain briefly. 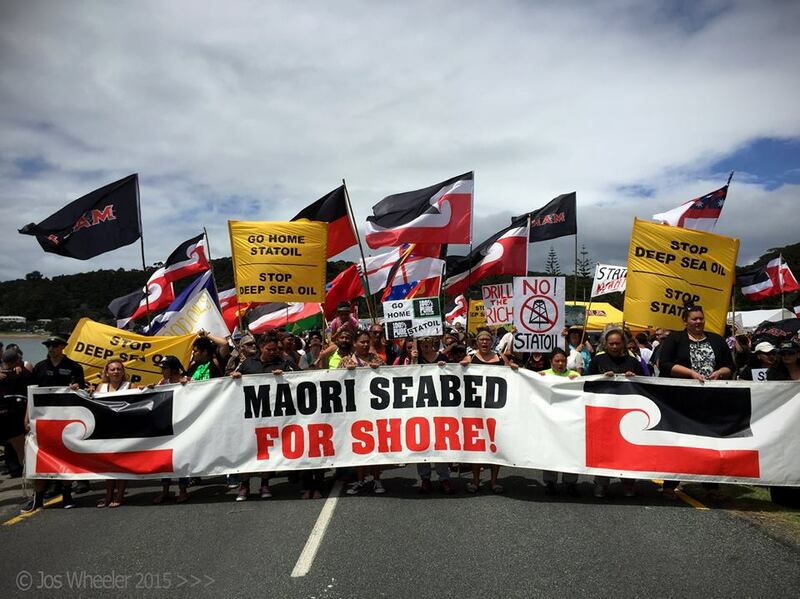 Communities are Still fighting against Deep Sea Oil Drilling and Statoil, as well as the government who has dispossessed in one swift pen stroke all the foreshore and seabed from Indigenous people of Aotearoa (Māori).